During great efforts, the pigeon's metabolism produces an increased amount of waste. Degradation and excretion of waste materials such as uric acid, lactic acid and carbonic acid are an additional burden for the animal. During the flight, there is also a significant loss of body fluid. For these reasons, it is important to give the pigeons into drinking water when returning home from a flight of Natural Electrolite. The water balance is back in order, the electrolyte supply is supplemented and the acid-base balance quickly restored. At the same time, the glucose contained in Natural Electrolite ensures the immediate supply of energy, so that the recovery time is shortened. Certain diseases such as adenovirus and paramyxovirosis cause a very watery droppings and as a result significant losses of minerals and body fluid. In these cases, Natural Electrolit prevents dehydration and thus accelerates healing. Dosage: Packaging 750 g: 1 scoop (20 g) of electrolite per liter of drinking water. Return the pigeons to drinking water when returning from a race of Natural Electrolite and leave them on the stroke until after the evening feeding. Pigeons participating in long-distance and long-distance flights are on their way for several days and nights. It is very important that these pigeons are basketed with sufficient reserves of electrolytes (body salts). That's why we recommend adding Natural Electrolite to drinking water. 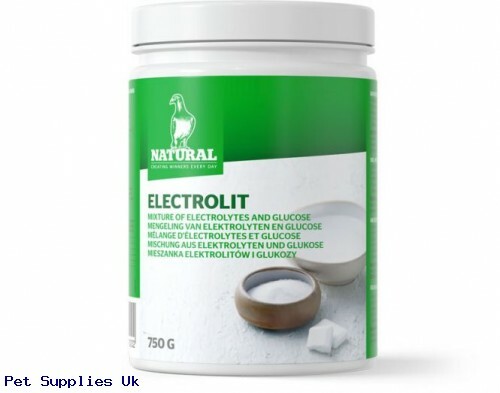 Give Natural Electrolitol over the drinking water until the feces are back to normal.